Apparently, no one has taken a picture of one of these things in the past 20 years. Earlier this week, it was revealed that the Department of Homeland Security (DHS) suspects unknown actors of operating cell-site simulators in the Washington, DC, area. 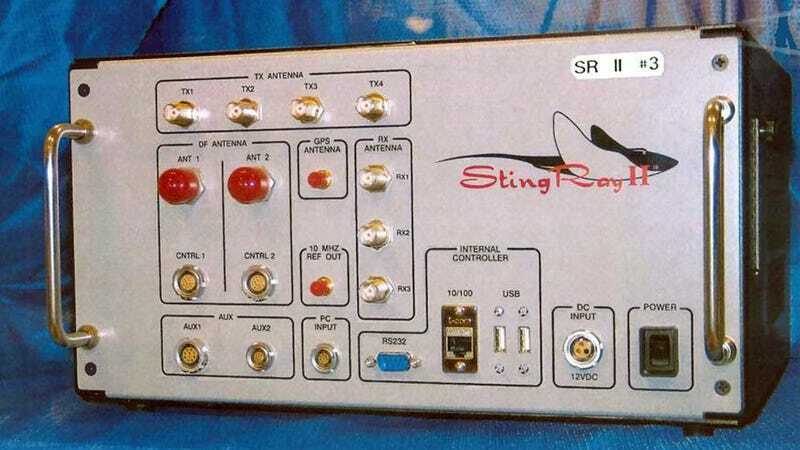 The devices—known as “Stingrays” after the most popular model manufactured by defense contractor Harris Corporation—are widely used in the United States by federal, state, and local law enforcement agencies to locate suspects via cellphone signals. Cell-site simulators may also be used to surreptitiously collect content from cellphone users, including messages and emails sent by phone. The devices work by forcing nearby cellphones to drop their connections to legitimate cellular networks and re-connect to a suitcase-sized portable device that mimics a cell tower. The devices are highly disruptive when deployed in densely populated areas, and tests have shown they may block emergency calls, even when programmed not to do so. In response to questions from Sen. Ron Wyden, Democrat of Oregon, DHS said it had observed “anomalous activity” around the nation’s capital consistent with cell-site simulator usage. The agency also said it had neither validated nor attributed the activity to specific entities or devices. One conceivable scenario involves foreign spies deploying the devices around government offices to collect intelligence, though that’s far from confirmed. The letter was signed by Rep. Frank Pallone, Jr., ranking member of the House Committee on Energy and Commerce, Rep. Eliot Engel, ranking Member of the House Committee on Foreign Affairs, and Rep. Bennie Thompson, ranking member of the House Committee on Homeland Security. Four years ago, the FCC formed a task force to address the “Stingray” issue; however, no solutions were generated and the group no longer meets regularly, the Associated Press reports. Given how cell-site simulators work, it’s unclear what could be done without the direct involvement of phone manufacturers. The devices trick cellphones into connecting to them by taking advantage of a phone feature intended to preserve battery power: Cellphones always connect to the nearest cell tower available to reduce the signal strength required to ensure a strong connection. When a cell-site simulator is in use, nearby cellphones will connect to it instead. It’s unlikely, however, that a company like Apple, for instance, would integrate technology into its phones helping it distinguish between devices used by law enforcement and those used by malicious actors. That would undoubtedly be viewed by the public as endorsing the use of the devices, which are controversial due to the fact that police typically keep their use secret, even from the judges overseeing cases in which evidence is collected with the aid of a cell-site simulator. State and local agencies that procure cell-site simulators, often with the help of federal grant money, have generally been required to sign non-disclosure agreements with the Federal Bureau of Investigation. Warrant applications for their use, prewritten in the past by the Justice Department, have failed to disclose their disruptive nature, often by comparing them to other, far less invasive surveillance technology. The FCC did not immediately respond to a request for comment.